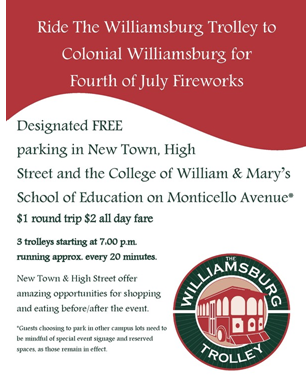 Join us in Williamsburg for a vibrant and patriotic Fourth of July celebration. 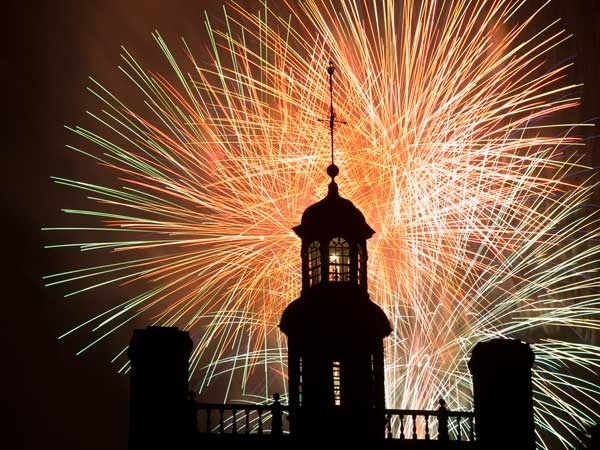 With a dramatic reading of the Declaration of Independence, a leisurely picnic in the Palace Garden and a dazzling display of fireworks—you’ll want to come early and stay late into the evening. Begin your Independence Day celebration with our special morning militia muster in “The Revolutionary City” and a dramatic reading of the Declaration of Independence. Spend your afternoon touring the city before the evening Independence Day Celebration. Our stunning fireworks display—and your participation with glow sticks—finishes out the night. Celebrate the anniversary of the nations birth in the Revolutionary City! Join Colonial Williamsburg for a special militia muster. Enjoy a salute to the 13 original states, featuring music performed by the Fifes and Drums, flags of each state, the firing of muskets and cannon. Red, white, blue and you! You dont want to miss Independence Day in Yorktown where our independence was won and patriotism abounds. 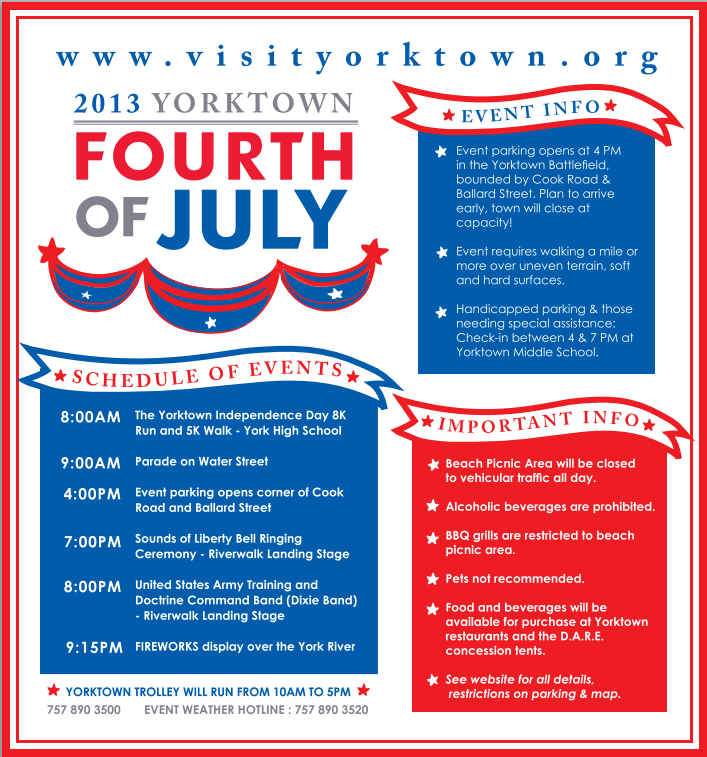 Come to historic Yorktown and salute America along the waterfront! Festivities. Lee Greenwood rocks the stage at Busch Gardens on July 4. Busch Gardens Live is bringing the heat with a sizzling summer line-up. Concerts will be held at the Busch Gardens Royal Palace Theatre. Celebrate the holiday weekend with some local music talent and a National Act! 5:30pm-6:30pm Johnny St. Clair 7:00pm 10:00pm Highway 101 Gates open at 5:00 pm in Sullivan Square. Concert is rain or shine. Children under 12 are FREE. Military and tactical drills, and role-playing demonstrations salute the anniversary of Americas independence. Visitors can see in museum galleries a rare broadside printing of the Declaration of Independence dating to July 1776. The Romantics rock the stage at Busch Gardens on July 5. Busch Gardens Live is bringing the heat with a sizzling summer line-up. Concerts will be held at the Busch Gardens Royal Palace Theatre. Winner NBCs The Voice. With special guest Bria Kelley. Concert held at the Lake Matoaka Amphitheater at William & Mary. Guests get an inside the ropes tour of the original 1607 James Fort, once thought lost to history. Join Dr. William Kelso who led a team of Jamestown Rediscovery archaeologists that found the original fort site in 1996. Back for the 22nd year, the full Heritage of America concert band will play American favorites and patriotic tunes in honor of Independence Day. Dont miss the annual July 4th Summer Sidewalk Sale at Williamsburg Premium Outlets. Enjoy extended hours and extra savings on top of our every day savings of 25% to 65%. The Summer Breeze Concert Series will kick off with the fan favorite Independence Day Concert on July 2, and run each Wednesday through August 27. More of what you love in the heart of downtown Williamsburg. Producers of locally grown: produce, seafood, cut flowers, organic vegetables, herbs, baked goods, pasture-raised meats, cheeses, herbal and goats milk soap, fresh bread, pumpkins, honey and eggs. Jul 4, – at 5, 6, 7, 8 and 9 p.m.
Raining outside? Cant stand the mosquitoes? All the good viewing spots taken? Come enjoy the most amazing Fourth of July laser displays in the Virginia Living Museums nice cool planetarium! Spirit of America is a laser show full of great patriotic music. Annual commemoration honoring Benjamin Harrison V, one of seven Virginia signers of the Declaration of Independence and 18th century owner of Berkeley Plantation. *Buses to “The Revolutionary City” will not run during the fireworks. Please plan to arrive early. Starting to dread the traffic and parking hassles on the 4th of July? The Williamsburg Area Transit Authority (WATA) is offering a great alternative. Park at New Town or High Street and ride one of the three trolleys scheduled to run at approximately 15 minute intervals. The Trolley will begin its normal service at 12:00 p.m. and run until 11:00 p.m. Passengers can ride all day for only $2.00. As an added bonus, starting at 5:00 p.m., the first 200 children on the Trolley will receive a Patriotic Glow Necklace or Bracelet. For more information on the Williamsburg Trolley please call WATA 757-220-5493 or visit their website to view the new trolley route and schedule. The 31st annual "Ice Cream Social" has become a tradition for locals and visitors and is sponsored by Sentara Williamsburg Regional Medical Center Auxiliary. 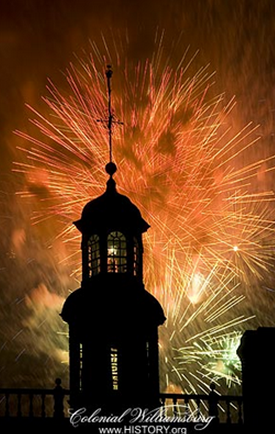 The event takes place 4:30-7 p.m. July 4, 2013 in the Wren yard in front of William & Mary. Sponsored by the auxiliary of Sentara Williamsburg Regional medical Center. Music by Smith Wade Band. Ice cream, cake, hot dogs, soft drinks, raffle prizes, games, face-painting. A HUGE scoop of ice cream and some homemade cake costs $3. Hot dogs will be sold for $3 and soft drinks will be $1. The social has become an ideal place to spend some time before the gala fireworks display in the Historic Area at night fall. This is a a great community event and a nice place to picnic before the fireworks in CW. There are always a lot of people–and especially families–who attend and we look forward to good weather. Please plan to attend and bring your co-workers and friends and family ! 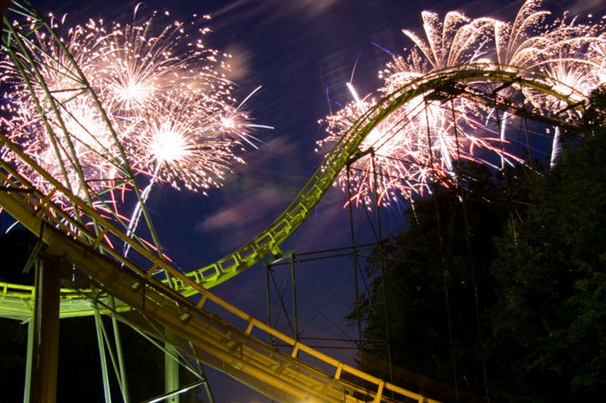 Join Busch Gardens Williamsburg in celebration of summer at IllumiNights — a nightly extravaganza featuring live performances, music and special effects that culminate in a park-wide firework spectacular. July 1 through Aug. 11, journey through the park as each village celebrates IllumiNights in its own way with multiple performances throughout the evening. Enjoy special shows in each country at 5:30, 6:30, 8 and 9 p.m..
Each night enjoy a fireworks spectacular starting at 9:30 p.m..
Busch Gardens is the source for nighttime fun this summer when IllumiNights: A Busch Gardens Encore returns with 50 nights of spectacular live performances throughout the park followed by nightly fireworks. Guests can visit Ireland for The Legend of Killarney, where larger-than-life puppets spin a magical tale of leprechauns and a lost fortune. In France, Voila! transports families to the bustling streets of Paris where outdoor performances including exciting ladder walkers entertain park guests. In Italy, lush gardens transform into a stage for an Italian strength troupe at Giardino Magico. In addition to the other night-time entertainment, Germany’s Oktoberfest Plaza is turned upside down with colorful characters and crazy critters at the all-new Wunderbarn!. Henrik and Helga, owners of the zany Black Forest Farms lead the German festivities that build to a rollicking finale with park guests’ favorite, The Chicken Dance. Park performances begin nightly at 5:30 p.m. and culminate with the park’s signature Tour de Force: Fireworks Finale at 9:30 p.m. This spectacular fireworks show blends dazzling color with an original score that can be viewed throughout the park. It’s the perfect summertime capstone to a wonderful day at the Williamsburg theme park.  For additional event information, please visit www.yorkcounty.gov/fourth or call York County Parks and Recreation at 890-3500. There’s no better place to celebrate independence than the town where so much history was made. Bring your family and spend the holiday with us this July 4th. 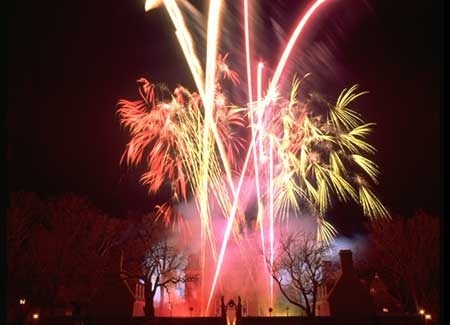 As darkness falls, high flying aerial fireworks visible from much of the Historic Area celebrate our nation’s birthday. 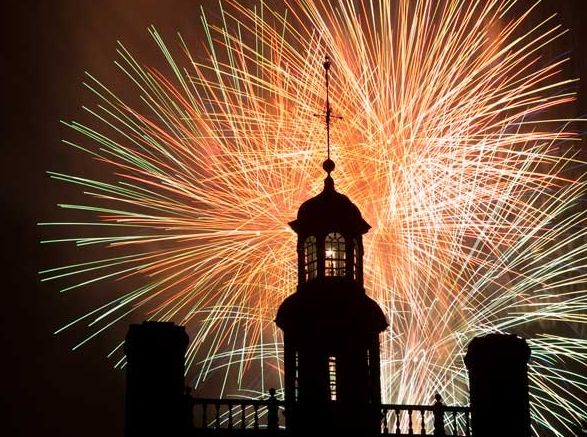 The best places to see these spectacular fireworks are from Market Square, Palace Green, or the Public Hospital grounds. Parking is available at the Visitor Center but, due to heavy traffic, shuttle bus service to the Historic Area is not available from 8:45 until 10:45. Shuttle bus service is available with or without tickets on the 4th of July. Join us for a vibrant and patriotic Fourth of July celebration. With a dramatic reading of the Declaration of Independence, a leisurely picnic in the Palace Garden, a performance by the Virginia Symphony Orchestra, and a dazzling display of fireworks—you’ll want to come early and stay late into the evening. Attend a lively picnic filled with colonial entertainments in the garden of the majestic Governor’s Palace. Guests will enjoy a tasty menu of boxed dinner options—as well as exclusive, reserved seating for the performance by the Virginia Symphony Orchestra, led by the amazing JoAnn Falletta. Guests will also enjoy a prime view of the spectacular fireworks display at 9:30 p.m. Join us for a leisurely meal and a front-row view of this memorable evening. Seating is limited, so reserve your tickets today. The 30th annual "Ice Cream Social" has become a tradition for locals and visitors and is sponsored by Sentara Williamsburg Regional Medical Center Auxiliary. 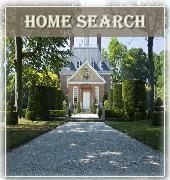 The event takes place 4:30-7 p.m. July 4, 2012 in the Wren yard in front of William & Mary. Sponsored by the auxiliary of Sentara Williamsburg Regional medical Center. Music by Smith Wade Band. Ice cream, cake, hot dogs, soft drinks, raffle prizes, games, face-painting. Take advantage of free parking at the Colonial Williamsburg Regional Visitor Center, where you can purchase admission tickets and use our shuttle bus service. Please note that the pedestrian bridge to “The Revolutionary City” will be closed to traffic from 9:15 to 10 p.m.
For additional event information, please visit www.yorkcounty.gov/fourth or call York County Parks and Recreation at 890-3500. 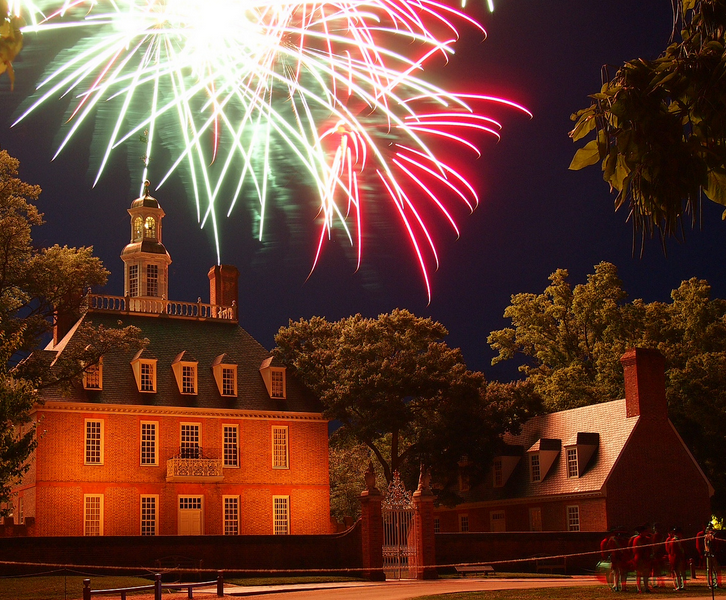 On the Fourth of July, guests can walk the streets where Thomas Jefferson, author of the Declaration of Independence, once walked and celebrate more than 250 years of freedom with family programs, music from Colonial Williamsburg’s Fifes and Drums, and fireworks. Patrick Henry speaks to townspeople about the choices confronting American and invokes his famous speech that calls America to arms at 11 a.m. during “The Times That Try Men’s Souls” in front of the Raleigh Tavern. Join us on July 4 for an all-American picnic and festive patriotic entertainment. Dine on a variety of chilled picnic favorites and Colonial Williamsburg specialties at the annual summer evening picnic from 7:30-9 p.m. on the Governor’s Palace grounds. Enjoy exciting performances by musicians, dancers, storytellers and balladeers plus plenty of games for the kids. Guests receive a free commemorative picnic blanket, so all you’ll need to bring are your chairs. March with the Colonial Williamsburg Fifes and Drums to a premium, reserved viewing area for the fireworks extravaganza. Cost is $55 adults and $25 youth (12 and under) and includes tax and gratuity. For more information and reservations, call 1-800-447-8679. Reservations must be made by July 2. In case of rain, call the information hotline at (757) 565-8888. For dinner, guests can choose between pulled pork barbecue or barbecued half chicken served with southern baked beans and coleslaw. Williamsburg AleWerks draft beer and Williamsburg Winery wine will be among the beverages served. Tickets are $28 for adults and $12 for children six-12. Price includes nonalcoholic beverage, tax and gratuity. Reservations are not required. Prices, menu items and operating schedules are subject to change. Dinner is served from 5:30-9 p.m. on the Virginia Lawn at the Williamsburg Lodge. Entertainment begins at 6:30 p.m. Fireworks are at 9:15 p.m.